Now that Ashes of Love has ended, it seems that some viewing habits have moved in Mr. Nanny's favor as the show achieves many firsts. 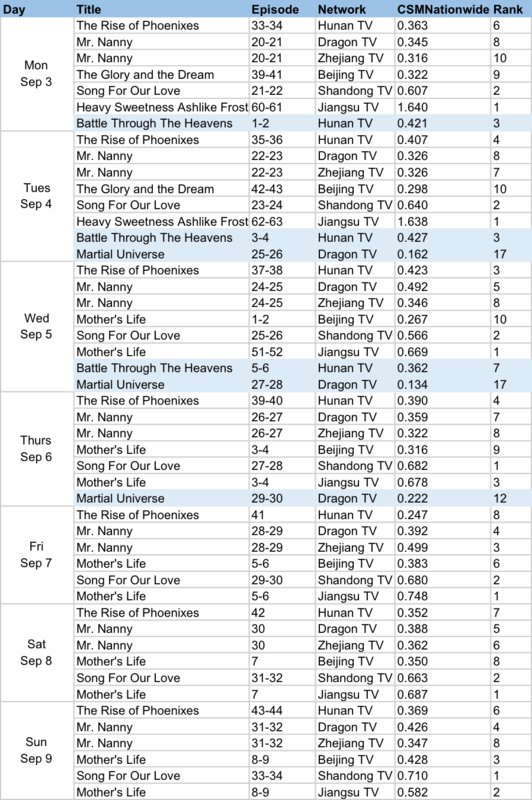 Already on its third week, it finally breaks past CSM52 ratings of 1% to be the leading drama on television. It has also climbed in online rankings to place in sixth. The newly-premiered Mother's Life leads CSM Nationwide though it has been taking turns with Song For Our Love for first place. What really strikes me as odd is that The Rise of Phoenix seems to be bringing up the rear in many occasions. Are people that uninterested? As for web rankings, Ruyi's Royal Love in the Palace comes in second only to Ashes of Love. Yang Zi has topped the celeb list! Unless there's another hit drama coming along that we haven't heard of yet, it should only be a matter of time before Ruyi becomes the most=-watched drama online. Inasmuch as the show has received its fair share of criticism, Wu Lei's Battle Through The Heavens joins his other drama Tomb of the Sea in the weekly top ten. Here’s the popular actress. Been top 10 even with no dramas. She deserves it! lol people still can't let go of HSALF yet!! And Yanxi too!! I managed to finish Operation Moscow. Prefer to watch Suddenly This Summer.